Do you like to keep the different temperature in different rooms? For example, you want it to be cooler in bedrooms and warmer in the living room area? In Cooling Panel you can divide your house into zones and choose a suitable temperature for each zone on each day and hour! You have to create linked devices to create a Cooling zone. Find the Cooling Panel on the list below and click Enter. Enter the name of the zone you want to add and click Add. In this window, you can change the temperature for each part of the day. Switch between tabs with the names of the days to set a suitable temperature for each day. Click on the temperature/hour value to change it. You can also check different days on which you want to use the same settings. To do it click checkboxes marked with the names of the day. In Manual Mode, you can set a suitable temperature for the moment you turn this mode on. Choose the zone in which you want to turn it on by clicking the checkbox next to the zones name. In Holiday Mode you can set a suitable temperature for the moment you leave the house for a longer period of time. Set the temperature you want to keep in your house while it’s empty. Choose the zone in which you want to turn it on by clicking the checkbox next to the zones name. To add rooms to the zone click the pencil icon next to the zones name on the left sidebar. 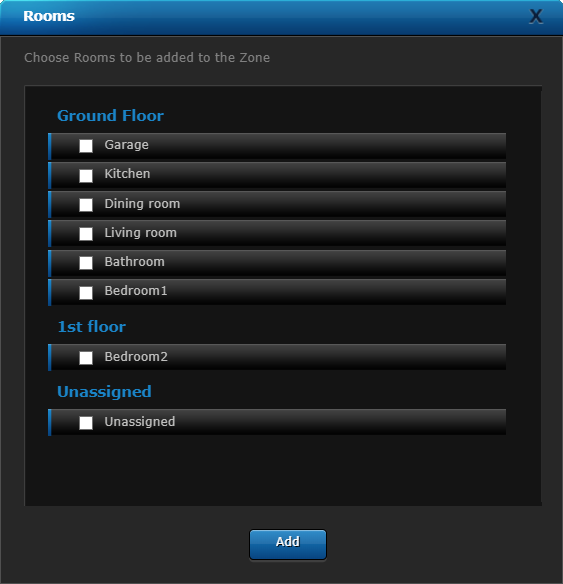 Select rooms you want to add to your Cooling zone and click Add. When everything is set click on the Floppy Disc icon on the right sidebar to save changes.